I have been wanting to write for a while but many unexpected things got in the way. I have much more to share about my rihla to Turkey, but the days are flying and new experiences are threatening to dull precious memories, as well as competing for blogging time and space (and I have been sternly denying them that). So I think this maybe the last post on Turkey. 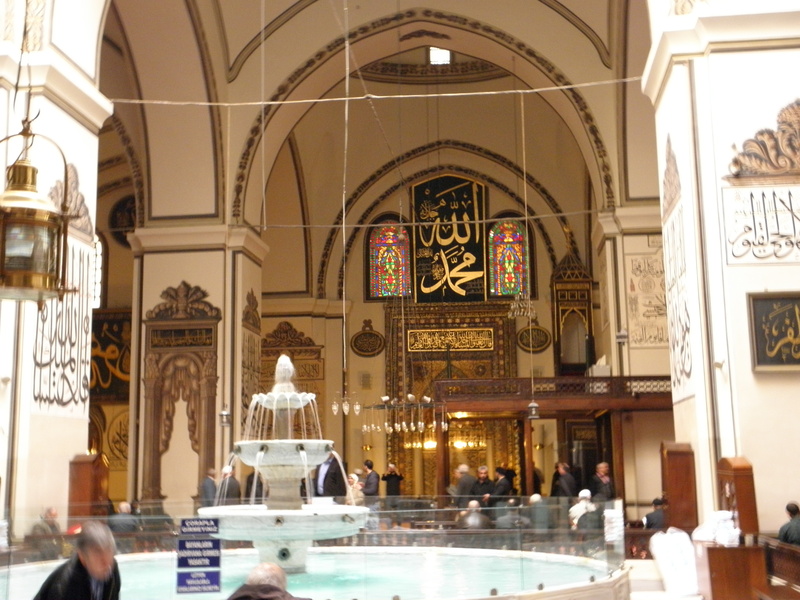 I chose for it a post about a very special camii we were blessed to visit. 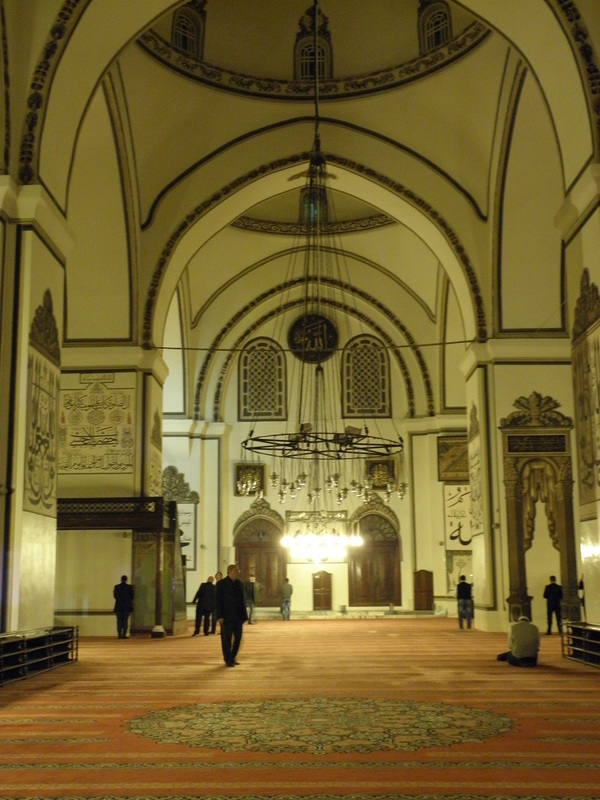 It is called the Ulu camii, also known as the Bursa Grand Mosque. It is an example of early Seljuk architecture and was built before the time when Constantinopole became the capital of the Empire, around the late 14th century. 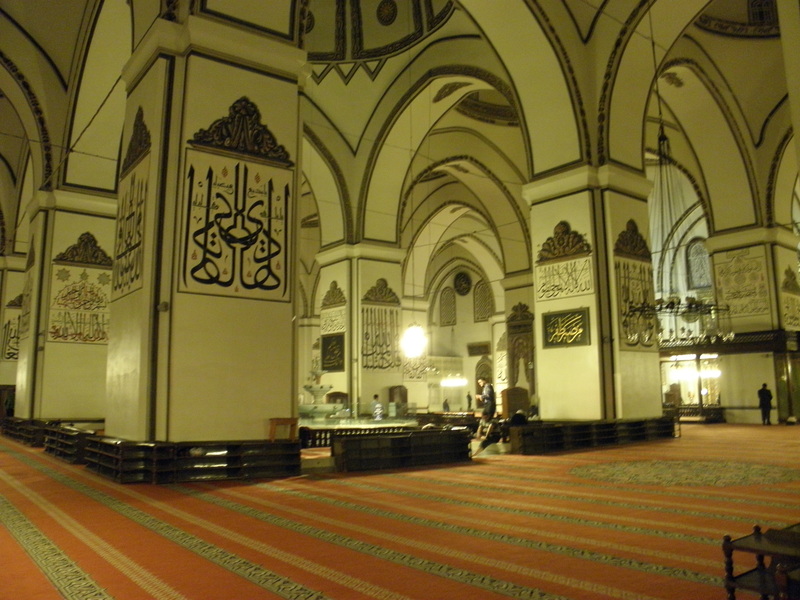 So it is from before the time of the great Mimar Sinan or the more famous mosques in Istanbul. Why is this masjid (=mosque) special? Well, when you see the pictures you will know. We took a day trip down just to see it and were blessed to join the congregation for the noon, afternoon and sunset salah (respectively called ‘dhuhar’, ‘asr’ and ‘maghreb’) there before heading back to Istanbul. It is located in Bursa, a ski-station actually, a beautiful old city located high up in the mountains, overlooked by the towering Ulu-daag (Ulu mountain). The mosque unlike the later masajid (plural of masjid) is decorated in only two colours; black and gold. There is minimal tile work and ornamentation. 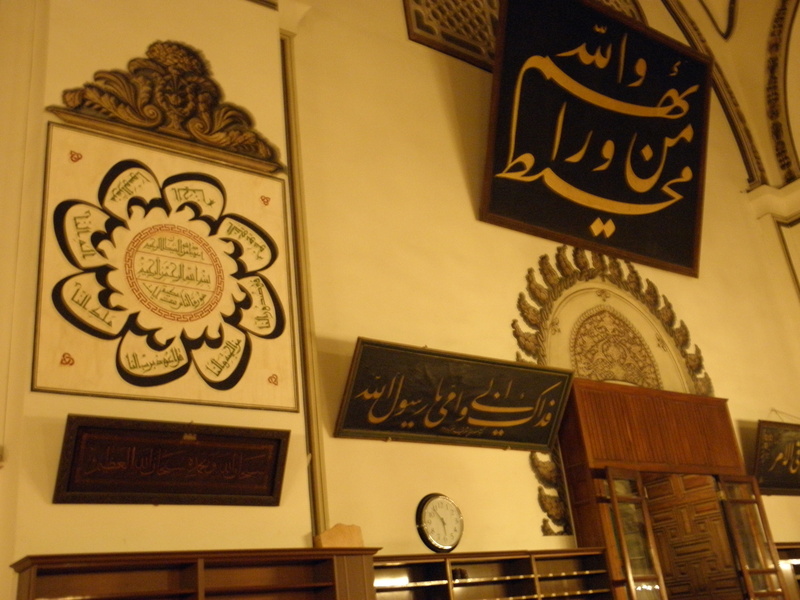 But what it does have is considered by some as one of the most magnificent displays of Islamic calligraphy in one place. 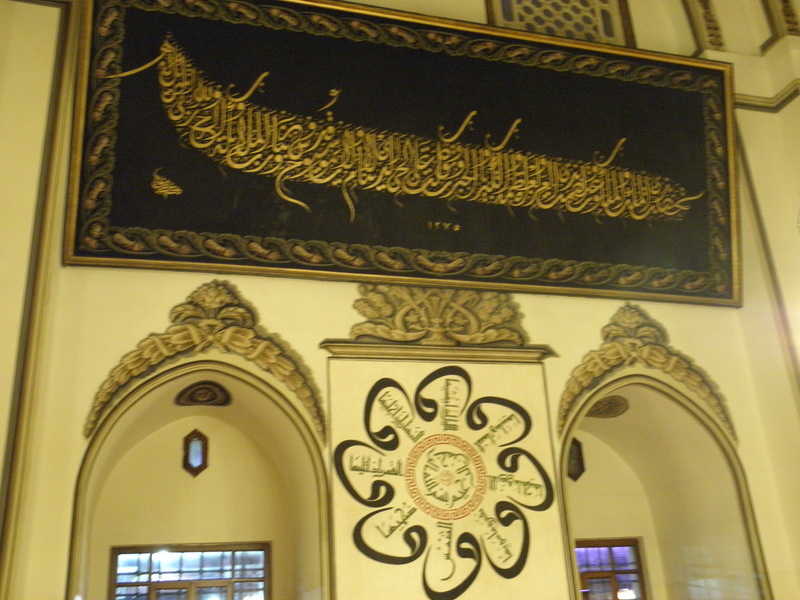 It has over 190 calligraphic panels and works painted on the walls of the mosque. Different verses of the Quran, Islamic phrases, saying of the prophet (peace be upon him). All done in a variety of the established classical styles of calligraphy. 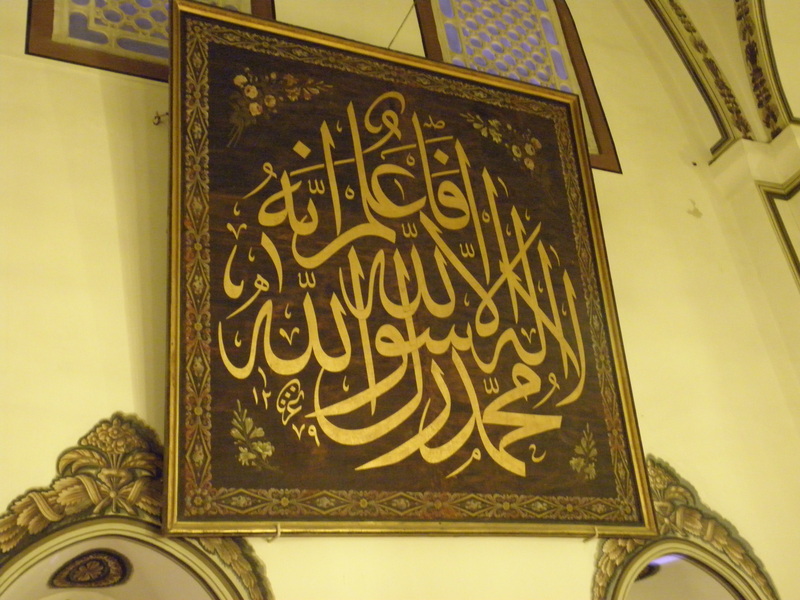 For those of you who don’t know, Islamic calligraphy has some classical styles and training in them is also handed down from teacher to student and follows the same ‘ijaza’ (=license) system of transmission. We were blessed to watch a master calligrapher at work, who has ijazaath (plural of ijaza) in I think all the major forms, and some forms took up to 13 years to master. 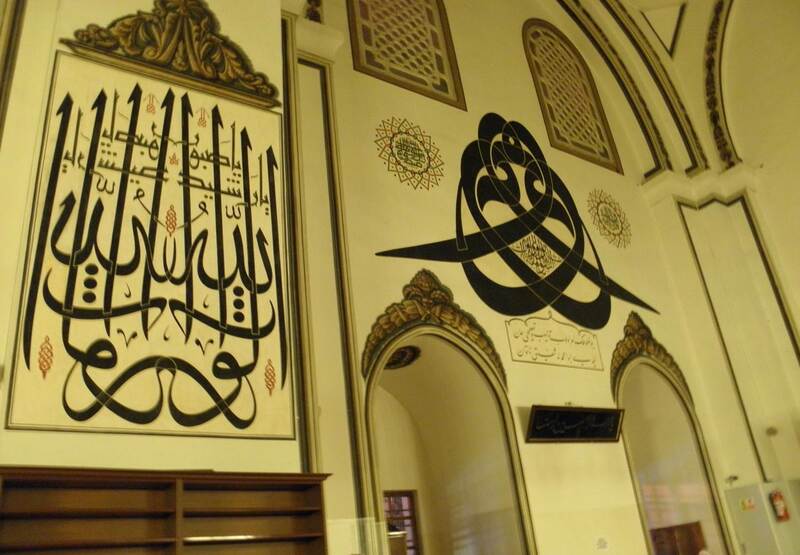 Islamic calligraphy is very mathematical as most Islamic art forms are …unsurprising as Muslim science always considered math to be a language of knowing the divine…there are secrets of the Universe mathematical principles can unlock that no other science can. And I guess in today’s language quantum physics and allied sciences are what I would also consider pure mathematics. But I am going off on another tangent, so I better stop. Look at this interesting paper for a computer application developed to do what the old masters did by hand, exploring symmetry and how it teaches us meanings about origin and end… Here is more detail on the theory. I will post pictures below. To leave you though, there is something very interesting in this masjid that I must share. Usually the place to take the compulsory washing one has to do before being able to enter the salah, called the ‘wudu’ in Arabic is outside. The wudu is often translated in English as ‘ablution’ and the idea is that one cleans ones external (the obligatory of this is to wash the hands and arms up to the elbows, the face, wipe over the hair and the feet. The prophet peace be upon him, would also wipe his ears and wash his mouth and nose so we often do that as additional and he would do this three times while reciting certain verses, so we follow his example, he also frequently brushed his teeth too) before one can enter the state of the ‘salah’ where Muslims believe we are standing directly in front of God which then is the time we go to clean our ‘internal’. Then before we go to the internal cleansing we undertake this external cleansing. So we can’t offer the salah unless we take our ‘wudu’ (certain acts nullify a wudu and then it has to be taken again, such as for example relieving oneself or falling asleep). However ‘ablution’ is a bad translation as it signifies the idea of prior sin, which is a concept foreign to the Muslim psyche. Rather the better translation I’ve heard recently is ‘lumination’ from an eminent English speaking Islamic scholar, Sheikh Hamza Yusuf Hanson, as the Arabic root word for ‘wudu’ comes from the same root as the latin ‘lumos’ (meaning gaining a state of light) comes from. To continue the taps to take the wudu are usually located in the courtyard outside the masjid as we enter the masjid after having taken our wudu. 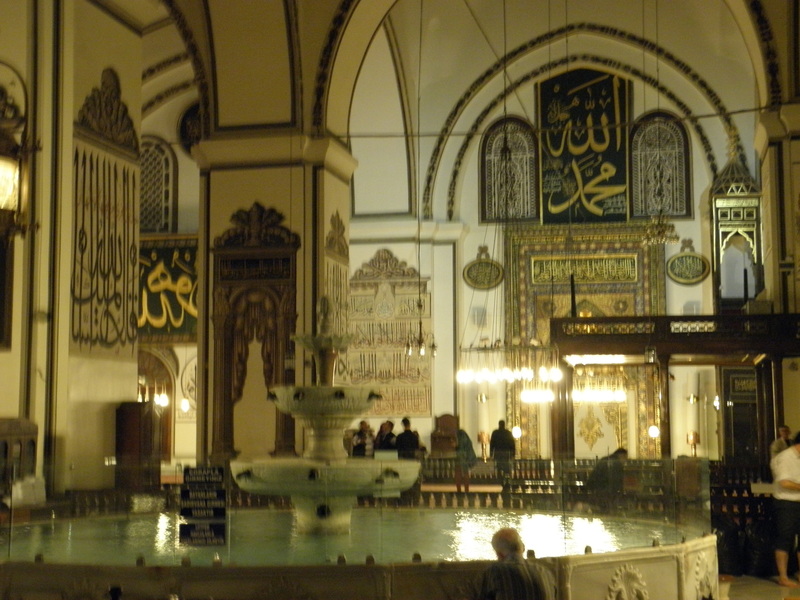 But in the Ulu camii there is a beautiful fountain (complete with fresh clean towels!) 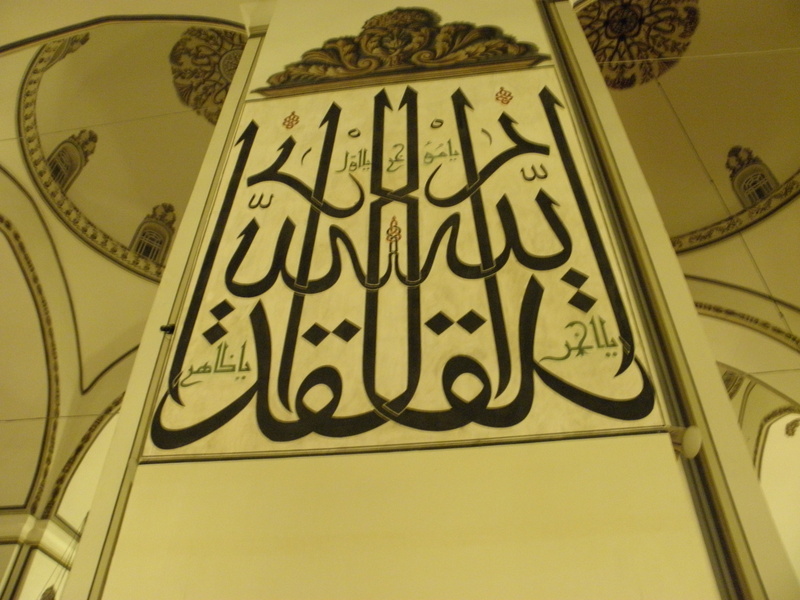 located inside the mosque. This was an anomaly and we were curious why. The story goes, that when the Sultan wanted to build the masjid he began to acquire the land for it. All was okay except there was an old lady who lived in this small hut right in the middle of the proposed property who refused to sell to the Sultan. And it is a testament to his good rule that he could not compel her to sell her land. The story goes that eventually she died, and left no heirs. Now the Sultan went ahead and acquired the land and construction was to begin. However here is a dilemma, would the prayer of those worshipers who prayed on this land be valid, in that though acquired it was not done so with the permission of the owner. So according to Islamic law (and remember Islam as a religious tradition is most known in terms of its contributions in the field of law) the land may not be ‘halal’ (permissible) or valid, on which to build a mosque. 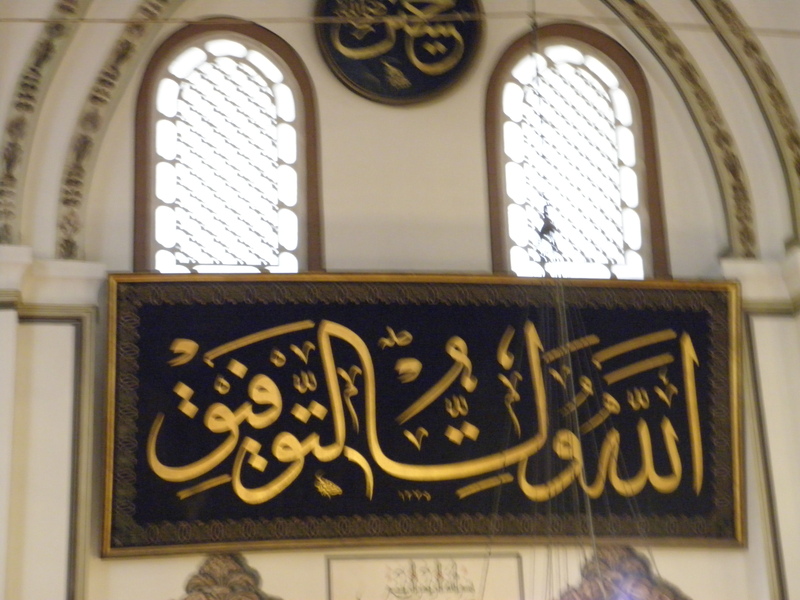 The ‘ulema (=scholarly community) had a cunning compromise to this dilemma, they could not halt the Sultan from building the mosque but they could not rule that the prayer offered on this portion of the land would be valid according to Islamic law, so they couldn’t sanction it either. Therefore they proposed that a fountain be built on the section of land that used to belong to the old woman so that no worshiper’s head would touch the ground on what maybe a space where a prayer is unlawful. Instead people take their wudu there! I was humbled by this level of scrupulousness and earnestness in trying to find the best solution to a problem not to mention ensuring religious works are done according to the highest morality. And I could not but help think of the status of many Muslim governments of today who don’t care how they do what and would even murder their own citizens in the name of religion. May God help us all. Beautiful, again. Thanks so much for the informative post, including your thoughts on “math to be a language of knowing the divine” and caligraphy – science and art together with philosophy. Dear genometalk, I honored by this comment and gladdened! Thank you for your generosity!